#92 - Druids Skinny Dip. Submitted by joequincy on June 5, 2008 - 12:30pm. I haven't seen the NE underwater form yet (my fiancée is a cow) but I can say that I never thought anyone could make the thing cute. Somehow you manage it, which both scares and amazes me. Submitted by Shocky_Monkey on June 10, 2008 - 9:29pm. eh It's a seal win the fishing contest and your under water form might be a fish. Submitted by interwebman on April 28, 2009 - 8:27am. on the other side I saw an undead warlock named EvilJesus. Submitted by JonseyMcFly on June 7, 2009 - 3:22pm. Submitted by Anonymous on June 22, 2009 - 12:20am. 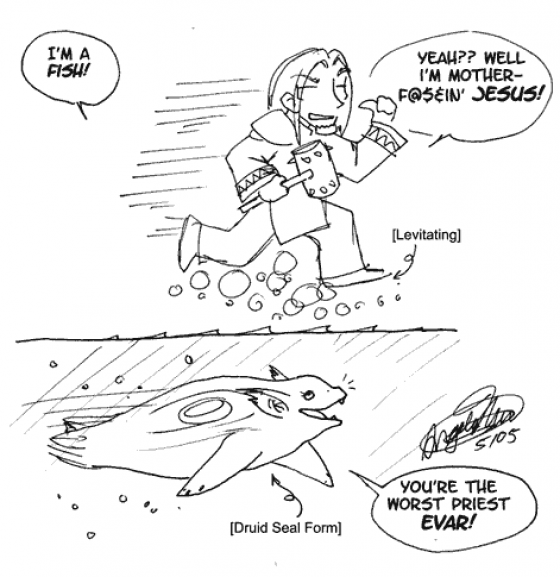 Druids in WOW can transform into FISH! How cool is that. I IS A FISH!